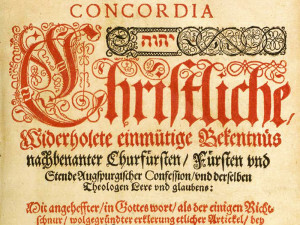 Those Lutheran churches today that wish to be and remain faithful to the authentic message of the Reformation are very concerned to remain true to the formal statements of faith that were agreed upon in the sixteenth century and gathered and published in a single volume in the year 1580, called the Book of Concord. To this day, pastors and other church workers in confessional Lutheran church bodies are pledged to these documents and state that accept these confessions as their own because they are a correct and faithful explanation of the Holy Bible. Members of confessional Lutheran congregations are assured that their pastors and others who serve them are remaining true to God’s Word when they are pledged to teaching nothing, publicly or privately, contrary to the Lutheran Confessions. The materials on this page will help you understand and appreciate the history of the Lutheran Confessions, what they mean, how they apply today. 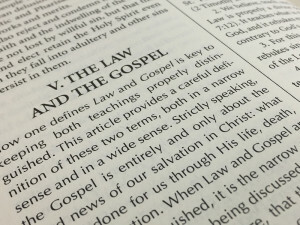 Additionally, you will be able to link directly to the individuals texts of the Lutheran Confessions. You will also find a very detailed historical introduction you can read online going into great detail about the history of each of the documents in the Lutheran Confessions. A poll was taken of over 2,000 Lutheran pastors, asking them to list the questions they most frequently are asked about the Lutheran Confessions as contained in the Book of Concord. Here are the questions, in the order of frequency. Following the questions, answers are provided.